Then we would meet in real life and run off to the Cayman Islands to sit on the beach uncomfortably together, complaining about how we asked for no salt on our drinks. Another edition of "What the Hell Am I Going to do Tonight?" 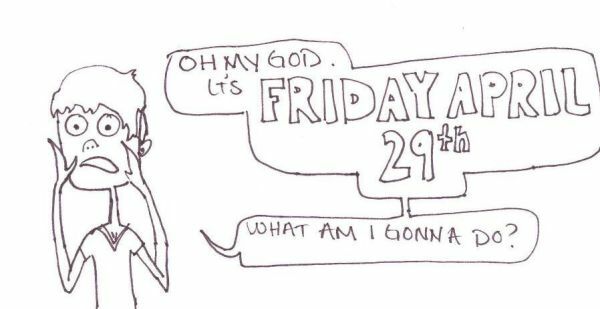 It’s Friday, April 29th and you’re a poorly drawn, slightly hipstery looking guy with claws for hands...what are you gonna do? All the best things come in pairs. Socks, feet, other things that involve socks and feet. Not twins, though. Twins are creepy and I’d appreciate it if you would stop telling me how much you wish that I had been born as them. It’s not a compliment, Mom, it means you want a replacement daughter, and I'm only sort of down with that. Anyway. Right. So, pairs. That's my really lame segway into telling you that there are two cool things I'm going to address in this blog. Call me a bad English student (I only majored in it for the babes), but I really don’t enjoy talking about the “classics” that much outside of a classroom anymore. Partially because there aren’t any over exuberant TAs around to nod while I’m talking and make me feel important, and partially because there are just way too many newer, cooler writers to talk about instead. Paper Darts week in a storefront! Anyone who knows me knows that I know a lot about a lot of stuff. Facial wound tending, avocado pitting, beer to chili adding...stuff like that. And the one thing I know more about than any other thing is animals. I know animals like dogs know their own butts. Skeptically at first, then gradually more accepting with each “air passing” doesn’t result in explosion. Because my mom always told me not to be stingy with all my vast quantities of very useful knowledge, here are some Fun Animal Facts for you to use with your friends when you want to sound smart. Fun Fact Number ONE: Bears are most ferocious immediately following their hibernation period. It’s been a while, hasn’t it? What have you been doing? How have you changed since we last spoke? Did your bald spot grow back in? Are you and Grandma on speaking terms yet? Wow. People sure do keep doing things even when I’m not paying attention to them, totally weird. I’m a little out of the blog writin’ groove so we’re gonna keep this entry simple til I get my boogie back. In the meantime, here’s some good music. This week featuring TOTALLY BITCHIN BABES. My friends, Tuesday, April 6th was that time for Paper Darts. We participated in Opium Magazine’s first ever Twin Cities’ Literary Death Match at Club Jaeger, and we lost. Like the one squirrel that got away, the lost title of best literary voice in Minneapolis will haunt us forever. Not because we failed, but because we were cheated, duped, swindled, and shafted! That is the type of blog I would be writing if I was even remotely capable of exemplifying any of those things. I know many of you (based on the one of you who commented on my last blog) are hankering for me to make this blog a little more, well, relevant to Paper Darts and anyone who has a normally functioning brain. And while I would (probably not) love to do that, I just can’t. There has to be a stupid one in this club, and Meghan and Jamie both immediately agreed that I fit the bill best. Kinda like Harpo I guess, and who the hell doesn’t like Harpo? I’m going to talk about the Nasonex Bee for a while. 1. (love) N-Bee is really sweet to his lady friend, Bee-ina. Even if she’s snotty and gross and knocks him over with her Bee sneezes, he still says that her congestion will never keep them apart. Feb 4 Is Regan Awkward? It’s getting harder and harder to write these lists each week. I figure that’s either because I’m getting progressively less observational and creative or because I’m actually a lot cooler and less awkward than I think I am. I guess it could be both, but that would suggest that I am a woman of faults, which I am not. Look up “Regan” in the Urban Dictionary, you’ll see what I’m getting at. Thank you, whatever teenage girl named Regan entered all that stuff, I think you’re neat too. Regan Smith is Awkward and Uncomfortable More Often than is Normal for a Stable Human Being. Reading other people’s blogs, to me, is kind of like listening to other people’s dreams. Unless I’m in it or someone’s making sweet, sweet love, my attention span will last around thirty seconds before I zone out and start thinking about what I’m going to eat for dinner. Anyone who knows us knows that we don’t really like being modest. We also don’t really like being honest, either. What we do like, however, is embellishing base truths with touches of mythical flair in order to confuse you and drive your opinion of us one of two ways: 1) You believe everything we say and think we’re really cool and awesome. Or, more likely, 2) You think we’re lying, weirdo jerks. We’ve been talking a lot about frying pans recently. How we like to cook our eggs in them, how cool it is when our moms wash them for us, what we’d like to do with them when that one jerk steals our pudding in the lunchroom again.